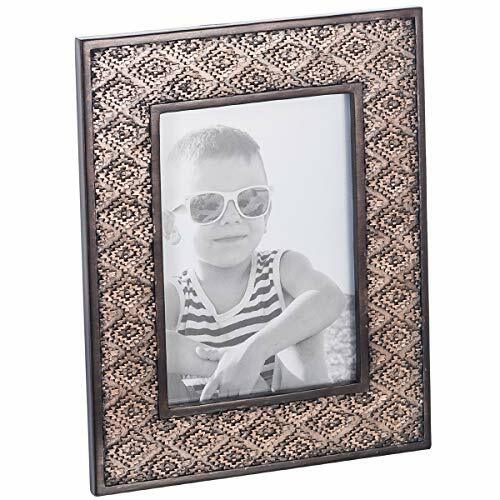 this 5” x 7” photo frame accentuates any space with its rich coffee brown hue and beautiful pattern that turns every picture into a conversation starter. and the easel back that makes displaying your photos an effortless affair. candle holders, to tissue box holders; designed to turn any house into a warm and inviting home. - Rich color and rustic design works with any décor. - Premium resin retains its look for ages. - Made with great attention to detail for striking aesthetics. - Glass front protects and preserves the life of your photos. - Has an easel back and can be used vertical and horizontal. Click ‘Add to Cart’ now to frame your photos with elegance completely risk-free! FRAME ADVANTAGE: Can Be Used Vertical and Horizontal, Blends Perfectly with Any Space or Accent in Any Room. HIGH QUALITY: This Heavy Resin Photo Frame Meets A High-Quality Glass Front, With Amazing Durability That Lasts. EASE TO USE: Comes with Easy Opening Tabs at The Back. Display It on Your Desk Using the Sturdy Easel Back. MEASUREMENTS: Size Fits 5x7 Inch Photos. Display Size Is 4.5" X 6.5. Actual Frame Size Is 8" X 10" X 0.6" Inch. GREAT GIFT: Bundle This Photo Frame with Matching Centerpiece Décor Accessories from Our Dublin Collection.